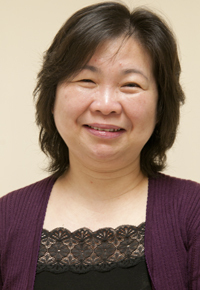 Mrs Chan lives in Hong Kong with her husband and learnt the Massage Programme during her first pregnancy. They practised during pregnancy and used the programme in labour at KWH. 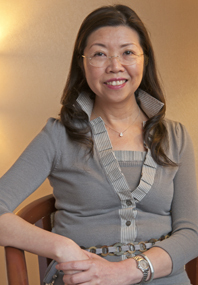 Mrs Chan had a 4 hour labour with an occipito posterior position. She used the massage and breathing techniques for pain relief and requested a small amount of entonox just before she gave birth. "After I learnt the massage programme, my husband did it for at least 2-3 times a week. There were significant changes in my pregnancy; enhanced sleeping quality. Before that, I woke up at least three times during sleep. After the massage, I could sleep well till the next morning. Marital relationship enhanced when I saw my husband committed in doing the massage. I felt satisfied as he could be involved in the pregnancy and he was supporting the baby and me." The first time I heard of the LK Massage Programme was in 2009 when my Departmental Operational Manager asked me to join the Basic Training Course. Before attending the course I was in doubt about the effect of massage on labor pain. During theoretical sessions, things including nocturnal symmetrical contractions; effects of massage on stimulation of melatonin and oxytocin, which in turn helps to promote maternal sleep quality and quantity and to prepare the room as well as the cervix for labour during the antenatal period...etc seems to be new to me. All these aroused my interest in attending the course. During the practical sessions, I was impressed by the level of comfort from the taught massage techniques and I almost fell asleep when enjoying the massage done by my partner. However, apart from the comfort level, I was still in doubt about its effect on labor pain because I had experienced the power of labor pain 10 years earlier. However, the course was informative, interesting and fruitful to me. I enjoyed the course content and it was a wonderful opportunity to learn from Linda, Anne and Mary. They were really caring and concerned about the cultural differences between Chinese & Western people. During the course they taught us a lot about techniques and the modifying positions for different situations. These really helped in our daily practise. Following the course when I practised the LK massage techniques on my first client during her intrapartum period, I completely changed my view about the effect of massage in controlling labor pain and even the pain behaviour of my client. Mrs ... G2 P1 told me that she felt totally relieved and relaxed after receiving the massage from her husband. She even forgot about the request for an epidural and ended up having a spontaneous vaginal birth shortly after the massage was done. So far, all comments from my clients and their partners were positive towards the use of the LK Massage Programme during labor in promoting comfort and reducing pain perceptions. At present, the use of the Massage Programme at Queen Mary's hospital is confined to the labor room, as no local data has been produced yet to justify the antenatal component of the Programme. However, on the basis of my experience I feel that this Programme helps couples to be emotionally connected during their precious time in the labor room. We see their interactions accelerate with the use of the massage and women really enjoy the moments of sensory touch during contractions and the support from their partners, in the form of massage. Some women express the feeling of being loved with the massage done by partners. Comparing the use of Pethidine before and after the introduction of the LK Massage Programme, a drop of 20% in Pethidine use seems to have occurred during the intrapartum period. If confirmed in a formal study, this shows strong evidence of the analgesic effects of the LK Massage Programme on labor pain. To convince our medical colleagues, we need to conduct our own research in the coming year to collect local data, in order to justify the use of this Programme as an effective form of non-pharmocolgical analgesia. "Our initiative in promoting non-pharmaceutical labour pain management in Kwong Wah Hospital started in 2002. Despite being a busy maternity unit, we introduced the use of the birth ball, music therapy, and breathing exercise during the birthing process for those interested mothers and midwives. Exploring more non pharmacological alternatives for pain management, I found the L K Massage Programme on the internet and sent 2 midwives to the U K to attend the course but felt that pushing forward the implementation and use of this Programme would be too slow with only 2 midwives trained. 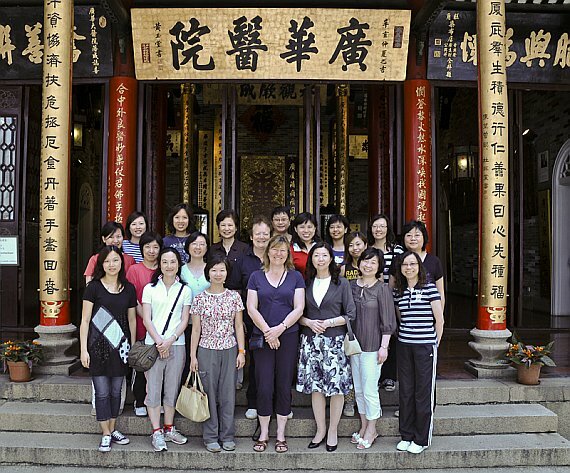 I therefore, in 2008, invited the L K Massage Programme teaching team to come to Hong Kong to teach our midwives. The first course was launched in 2009 for midwives of Kwong Wah Hospital and Queen Mary Hospital. Another 2 Basic and Trainer courses were conducted in 2010 and 2011. We found using the L K Massage Programme very helpful in alleviating labour pain and it was welcomed by both couples, midwives and Obstetricians. 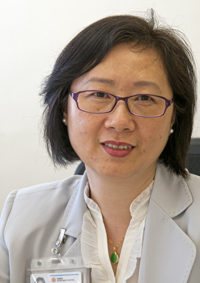 The Hong Kong initiative which is currently a collaboration with the Hong Kong Midwives Association and the L K Massage Programme Team, is to extend the access to all midwives in Hong Kong. As a midwife and the Chairman of the Education Committee of the Hong Kong Midwives Association, I am very grateful for the support from Linda, Anne, Mary and Lai Yen in delivering the Programme in Hong Kong. This assists us in the promotion of non-pharmaceutical pain management and normal childbirth." 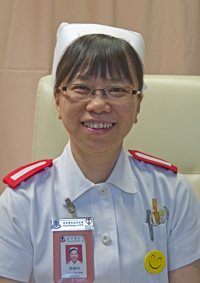 "Since training as a midwife, I have not seen much development in the use of non pharmacological methods for labour pain relief in Hong Kong. The use of pharmacological methods, such as Entonox, Pethidine and Epidural analgesia remain the methods of choice for relieving childbirth pain. As a midwife, I know clearly the side effects of each of the drugs towards the mother and the baby and wonder what a midwife can do to help the mothers in relieving childbirth pain by using non-pharmacological methods. I was fortunate to learn about The LK Massage Programme around 2 years ago. I and a few of my midwives attended the Basic Course and continue to use the Programme on some labouring women. We note that there is a positive impact on them during the last 2 years, The LK Massage Programme has been one of the focus for the midwives training provided in my hospital. Studies will be conducted to obtain evidence on the effects of using The Programme and I am looking forward to obtaining results which demonstrate positive outcome(s) on labouring women. "The LK Massage Programme is outstanding. It not only enriches the professional knowledge and skills on childbirth massage of our midwives, but also benefits the pregnant women and their families in Hong Kong. The professional teaching of the tutors of Childbirth Essentials is well received by learners. They are just wonderful!" "Before attending the LK Massage Programme's Basic Course, I always wondered whether massage would be effective for pain killing during labour. After attending the course, I do feel the massage is very helpful in pain relief. Moreover, after finishing the trainer course, I have a chance to take part in the massage teaching to couples in the antenatal period. Our rapport has been built up.The whole process inspires me that it is very effective and gives great satisfaction on couples not only in the labour process, but also during the antenatal period. From the reflection of my clients, it makes me feel confident on doing the massage and practicing well on couples, and enhancing the satisfaction on labour process. Therefore, I do hope the Programme can be commonly used in the future in natural pain relief." "I have learned about the LK Massage Programme for the first time in 2009. From clinical reflection in these two years, I find this Massage Programme an effective intervention to help both the women and their partners cope with the labour pain, both by physical and psychological means. Furthermore, it also enhances couples intimacy. Although promoting a new skill to experienced midwives is not smooth, my conviction, "sow a thought, reap an action" sustains me. Harvest takes time; yet the fruit of trust and success has proven fulfilling." "The LK Massage Programme gives me amazing experience with the couples. I can be involved in the labour process with them, to share the precious moment with them. It's my pleasure that they feel they are being supported,encouraged and energised. I really treasure the time to teach and do the childbirth massage to the couples." 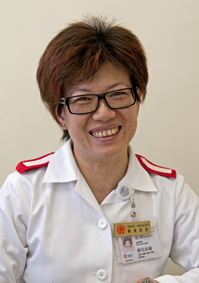 "I am a midwife in Hong Kong and act in a role as Advanced Practice Nurse in Kwong Wah Hospital . I am very grateful that I could attend the Basic Course for the LK Massage Programme and trainer course. It is useful for helping clients to relax and give pain relief during labour. Women are more satisfied with pain relief when their expectations of the pain and its relief are met. One client reflected to me that this massage method helped her feel encouraged, supported, was kind, had genuine concern and respect. Her husband expressed a feeling of being responsible and competent, and gave him a positive mental attitude. They all agree that it is an amazing and cheerful experience. The feed back from couples encourages me to promote this childbirth massage method." "I like childbirth massage, I don't know why but I gradually go deeper into my inner world, it seems that I lose contact with my outer world. Voices become softer and farer, I become lighter and lighter in weight. Just like floating in the sea and then I fell asleep. I know that I am not alone."